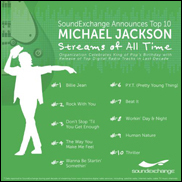 WASHINGTON DC — SoundExchange released a Top 10 list of the most streamed Michael Jackson recordings of all time. The list is based on data reported to SoundExchange during the past decade of streaming from non-interactive digital radio services including Internet radio, satellite radio, and cable TV music channels. The list is being released this week in conjunction with and in celebration of what would have been the King of Pop's 56th birthday. It features some of Michael Jackson's most popular recordings including "Billie Jean" (#1), "Beat It" (#7), and "Thriller" (#10). The complete Top 10 list can be found below.